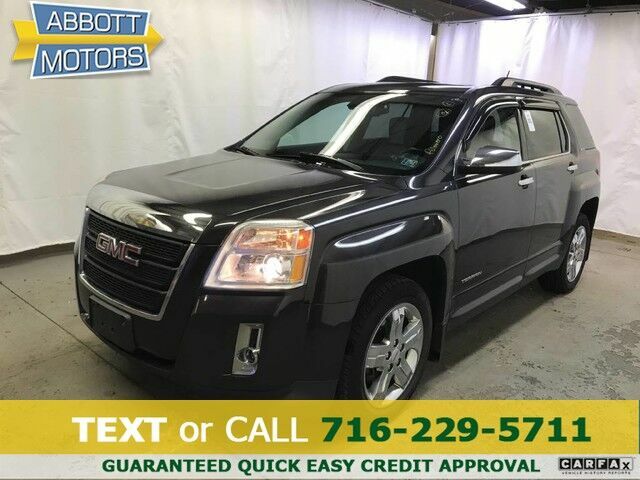 ABBOTT MOTORS, An exceptional car buying Experience, is offering this exceptional Carbon Black Metallic 2013 GMC Terrain SLT Premium Package AWD with Leather & Navigation for sale. ABBOTT MOTORS has over 50 years of automotive experience! We are also a CARFAX Advantage Dealer. We offer great deals and specialize in FINANCING FOR EVERYONE-ALL CREDIT APPS ACCEPTED! We look forward to helping you purchase your next vehicle. CALL or TEXT (716) 229-5711 for quick answers to your questions about this vehicle. Your message will be answered by a real human never an automated system This GMC includes: WHEELS, 4 Chrome Wheels CHROME AND TECHNOLOGY PACKAGE Chrome Wheels Navigation System Bluetooth Connection Auxiliary Audio Input MP3 Player SUNROOF, POWER AND TILT-SLIDING Generic Sun/Moonroof Sun/Moonroof Drive home in your new pre-owned vehicle with the knowledge you're fully backed by the CARFAX Buyback Guarantee. The GMC Terrain SLT Premium AWD offers a fair amount of utility thanks to its advanced features and unique styling. It's also quite sporty, and injects an ample amount of handling chutzpah into the ridin'-high body of a family-friendly SUV. Comfort. Performance. Safety. Enjoy all three with this well-appointed AWD 2013 GMC. Added comfort with contemporary style is the leather interior to heighten the quality and craftsmanship for the GMC Terrain If, upon choosing the road less traveled you find yourself lost, relax and remember this beautiful car has navigation. Beautiful exterior. Clean interior. This GMC Terrain is so immaculate it is practically new. The 2013 GMC Terrain is built with pure muscle. Punch the throttle and feel the power of its torque and horsepower plant you firmly to the back of the seat. This impeccably built GMC Terrain SLT Premium AWD comes with a plethora of added features that have made this vehicle a unique find. These options will simply amplify the experience of owning and driving this wonderfully crafted GMC. The tires on this vehicle have passed a rigorous inspection for safety, stability and tread life. This car has an exceptional paint finish that shows no sign of age or wear. Upgraded wheels enhance the look of this GMC Terrain. More information about the 2013 GMC Terrain: Starting about $25,500, the 2013 GMC Terrain is one of the most affordable crossover vehicles in its class; a class that includes the Honda CR-V and Toyota RAV4. The interior features a dual-cockpit design; ice-blue ambient lighting and sophisticated, classy appearance touches that make it look much more expensive than it is. This model sets itself apart with Powerful and efficient engine selection, sharp styling inside and out, and both available engines are flex-fuel compatible STOP IN TODAY or Apply Online 24/7 at Abbottmotors.com ... All Trade-ins Welcome... Same Day Delivery... Call or Text Today and See The Difference... We Look Forward to Serving You! !This vehicle may be subject to potential open recall(s). Vehicle recall information may be found at Safecar.gov. Please verify price, equipment, options and features with your sales rep before your purchase. We Look Forward to Serving You. *Tax, title, plates extra. All Financing On Approved Credit. BBB accredited A+ member.